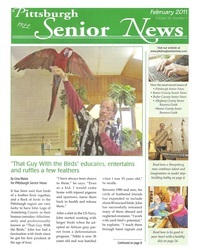 Media - That Guy with the Birds! ​Wednesday July 20th 2016, we had the privilege of being on one of our favorite TV shows "Let's talk tailwaggers" on BPTV. They always upload their videos to YouTube for the world to be able to watch! Hope you enjoy this episode! Behind the scenes with Maniac Magazine! 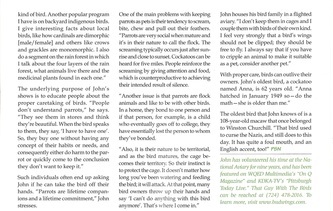 John was asked to have a few of his birds in a magazine shoot for Maniac Magazine! What Maniac Magazine had to say about their shoot-"This was by far one of our wildest cover shoots to date. We were inspired by Hotel Monaco’s bird-theme design and brought in nearly a dozen exotic birds to create the chic, tropical-like scene. Chloe was a champ when it came to working with the colorful, feathered creatures thanks to some help from her dog trainer and bird expert John Lege from ‘That Guy with the Birds’. This is one for the books!" That Guy With The Birds was invited back to BPTV for another episode of Let's Talk Tailwaggers with Susan Roberti. It's always a pleasure to be on her program, and we thank you so very much for al that you do for the our pets! 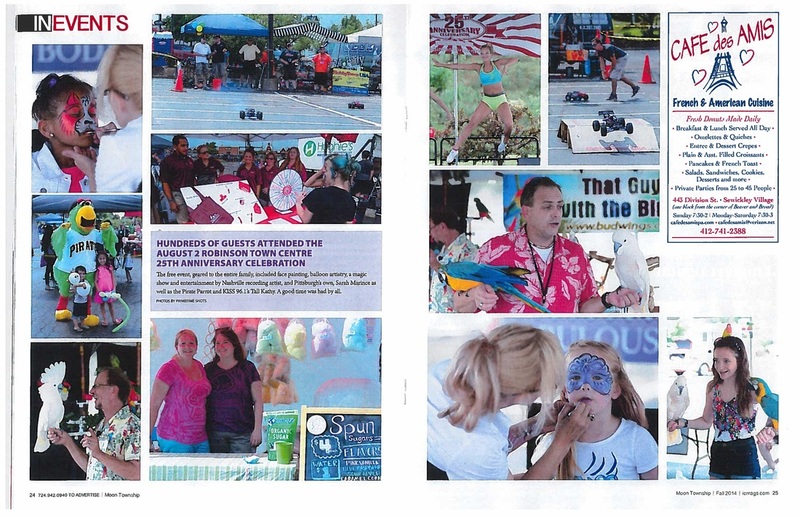 IN COMMUNITY Magazine did an article on the 25th Anniversary Celebration at Robinson Town Centre which we were a part of. Thank you Theresa Zamagias for sending us the article! John complete's the Ice Bucket Challenge! 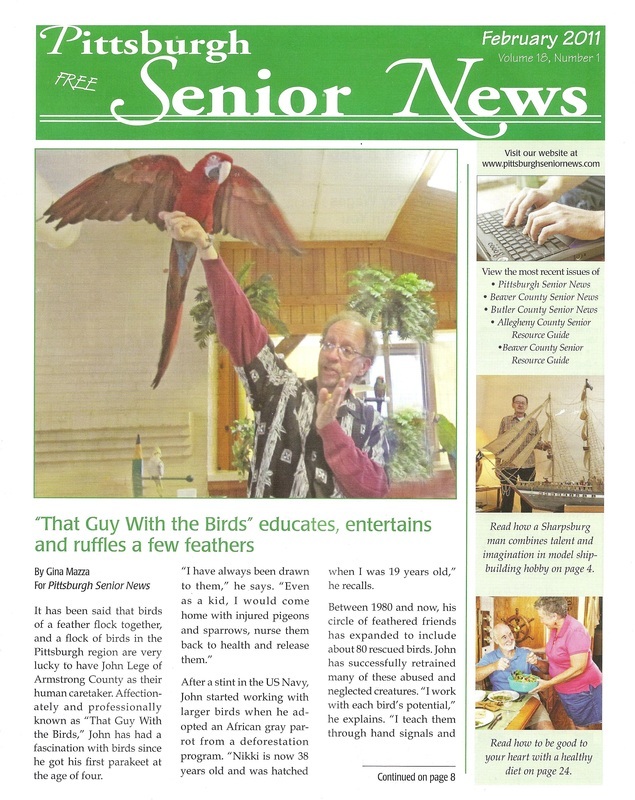 That Guy With The Birds is a proud supporter of many different organizations and hopes that you will reach out and support those in need as well. Every little bit helps! Click here for the ALS website and find out how you can help. Becca makes her first public appearance! John Lege AKA "That Guy With The Birds" dedicates a song about Alex to Dr Irene Pepperberg. John was on KDKA's morning show "Pittsburgh Today Live" promoting the Family Pet Expo being held July 12th-13th at the Meadows Casion. News footage from ABC 6 On your side in Columbus Ohio! April 25th-27th 2014 John performed at the All American Pet Expo! Their local TV station ABC 6 was at the event and interviewed some of the exhibitors as well as John to promote the event. 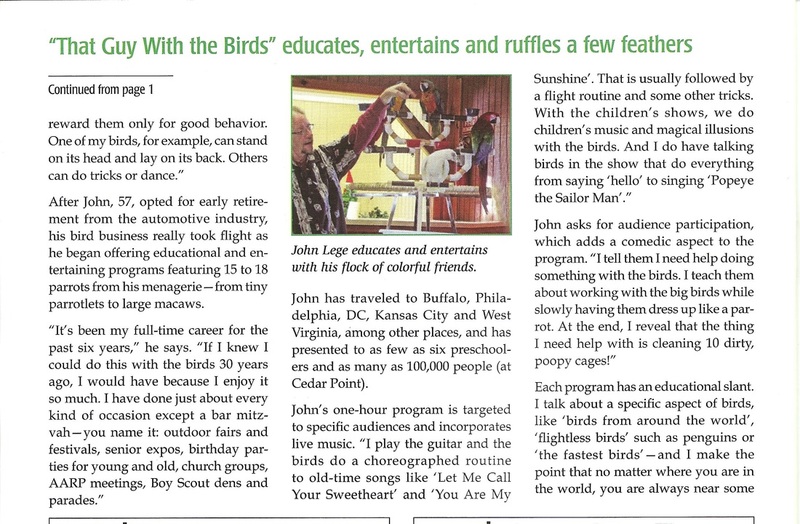 John was invited back to a local Pittsburgh channel (BethelPark TV) to talk about some of the birds he has taken in that the owners unfortunately just could no longer care for their birds. The birds were well taken care of, but sometimes "life changing" events occur in our lives (IE: health troubles or even a new child into the family) and the birds cannot adjust to these changes. 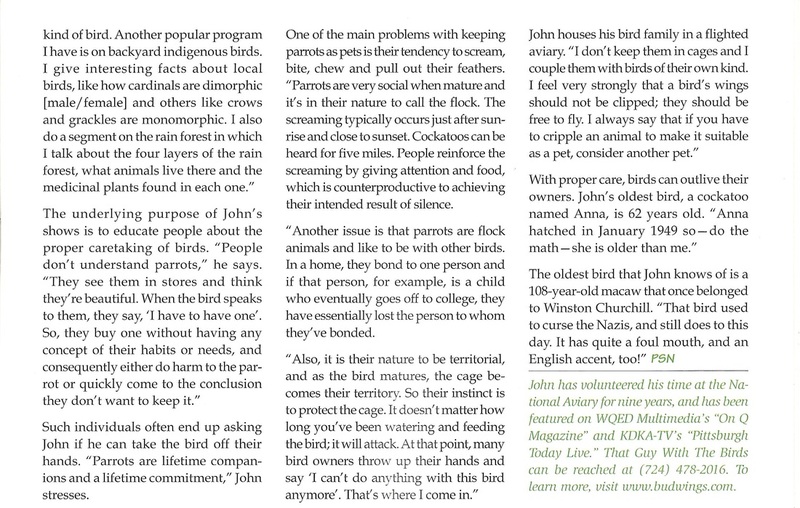 John talks about several of the birds that have come to his rescue that are just such the case. John would like to thank BPTV for graciously allowing him to tell their stories, so that people may think twice before purchasing a life long commitment that a Parrot can be. Be sure to visit BPTV's YouTube channel for more information about BPTV by clicking here. John was recently a guest on a local television program called "Let's Talk Tail Waggers" which is produced by Bethel Park Television. Saraphina is a Corella Cockatoo or also known as a Bare Eyed Cockatoo. She just loves to dance to that old time Rock & Roll! 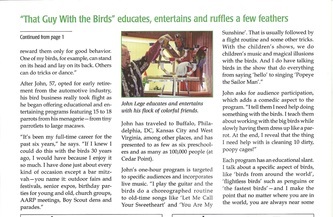 Below is an article where John is featured in the "Pittsburgh Senior News"
Click on each picture to read the article and find out more about "That Guy With The Birds"